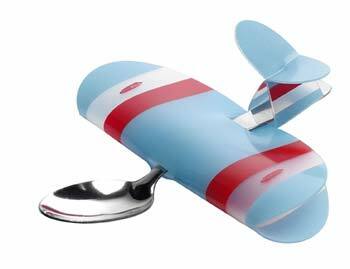 This is the BabyPlane, a ridiculous-but-kind-of-cool baby spoon I saw in a shop over the weekend. It's a basic baby-sized stainless spoon with a plastic airplane wrapper. A cute idea (for a gift I guess), but I really loved the packaging for it more (not pictured unfortunately). Ever wonder who makes all that cool, random gift stuff in cool, random gift shops in the West Village or on Melrose? I guess it's companies like Stilic-Force. On their website they've got some interesting things (in a clever-French-design kind of way), but if you want to buy online you'll probably have to rock a Euro or two.